Let’s talk pillows. We’ve already done an overview of shams, but what about some serious sham inspiration? Whether you realize it or not, shams can quickly transform the look of your bed. No matter if you prefer standard or Euro, knife-edge or trimmed, a pair of custom pillow covers could be all the décor your bedroom is asking for. Peruse the photos below for easy sham ideas to apply to your own sleep space. Imagine this room without the shams; it would be a tad dull wouldn’t it? It’s amazing how those two lovely boxed pillows enhance a very traditional space. The trims introduce the right amount of detail too. 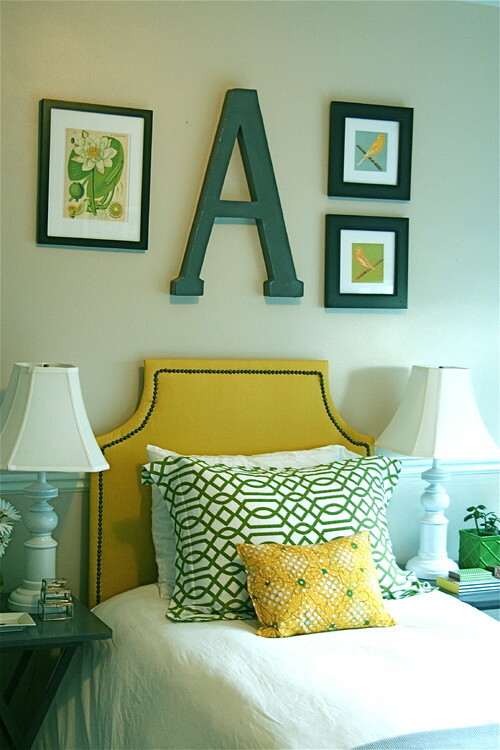 We’ve discussed how monograms can add personality to a space. 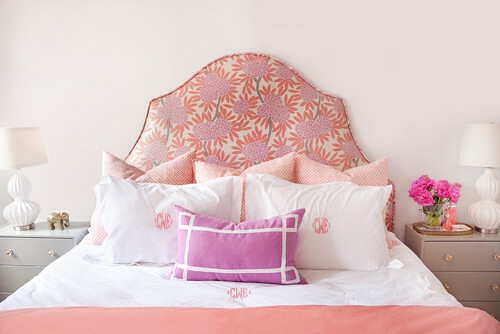 A layer of throw pillows acts as a backdrop for the crisp white shams in this girly bedroom. These shams throw a dash of pattern into this Chicago home. The floral picks up the blue wall color and connects every element in the room. 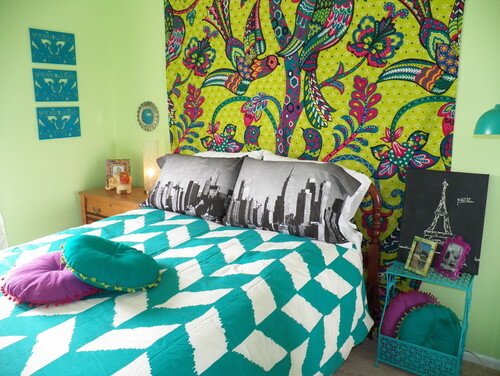 This teen bedroom doesn’t lack color or pattern but gets a dose of city skyline on its shams. This space beats a dorm room any day. Elegant and neutral, this calming Denver bedroom successfully boasts toile, seersucker, florals, and stripes. The button and ruffle introduce interesting details to the otherwise plain shams. This twin bed uses a simple green and white pattern on a single sham with a smaller throw pillow in front. 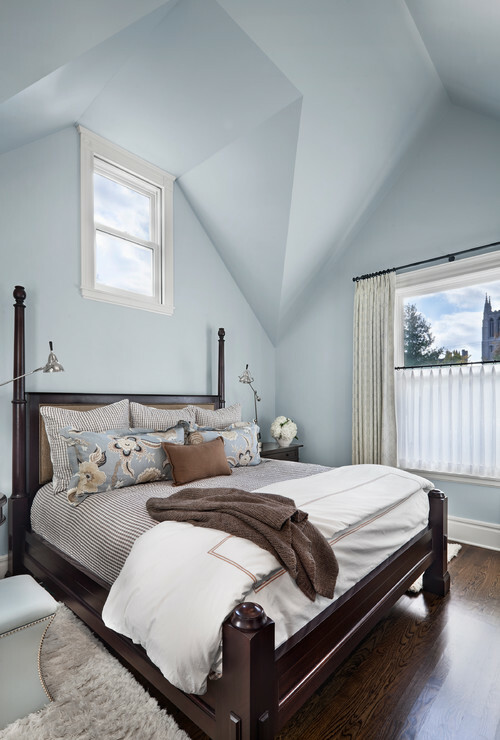 Every item is perfectly proportioned to the rest of the space in this Salt Lake City Bedroom. This mostly white room is modeled after a luxury hotel. Euro shams with embroidered edges complete the look. Remember, shams like these can be laundered with your sheets and duvet cover – an advantage over others, which usually require dry cleaning. We recently had a major garden renovation, with a tight timeframe for completion. One morning, in an effort to speed the finish, our landscape designers sent a group of six hard workers. It turned out to be an unseasonably cold morning, and as I looked out from inside my warm and cozy house and watched these guys toiling, my feelings of guilt turned to recipe inspiration. I thought, wouldn’t it be nice to offer them a little bite of hot food for energy and warmth? Something savory, perhaps, with a little cheese, a little bread, a little spice. Something breakfasty, fast, and easy to eat. Something to accompany a good hot cup of strong coffee. Why not a take on bread pudding, with a savory Italian twist enhanced by salty pancetta and a touch of parmesan? A little sautéing, a little chopping, and a little baking later, my Pancetta Breakfast Bake was done. I sliced it into little squares, and brought it out to my valiant landscapers. A warming little break from hard work for them, a warming little breakfast in bed for you. Grease a 9×9-inch baking dish and set aside. Wash, trim and dry spinach. Heat 1 tablespoon of olive oil in a heavy sauté pan over medium heat. Add spinach and cook until lightly wilted, about 2 to 3 minutes. Spread spinach evenly in the prepared dish. Add remaining olive oil to same pan, and sauté pancetta, shallot and minced garlic over medium heat until softened and fragrant, about 3 to 5 minutes. Set aside. Cut or tear bread into bite-sized cubes (should be around 3 cups). Spread bread cubes out evenly on top of the spinach. Arrange the sautéed pancetta, shallot and garlic on top of the bread cubes. Add eggs and milk to large bowl and whisk until slightly thickened. Whisk in Parmesan cheese, Italian seasoning, basil, salt and pepper. Pour egg mixture over bread cubes and let sit for 20 to 30 minutes to allow bread to absorb liquid. Preheat oven to 350°. Bake for 35 to 40 minutes, until lightly puffed up and the top is golden brown. To Hold the Bridge: Tales from the Old Kingdom and Beyond by Garth Nix. If anyone has been reading these book reviews for any amount of time, you will know that Garth Nix is one of my go-to young adult fantasy novelists. His Old Kingdom books (Sabriel, Lirael, Abhorsen and now Clariel) are my personal favorites. Well, Garth Nix has just released a new collection of short stories, and I couldn’t be happier. What’s more intriguing is that a few of these stories are set in worlds that fans of his novels will recognize and be excited to revisit. Others are surprisingly real-Earth based, but no less fun to read. The first story, To Hold the Bridge is a great little story from the Old Kingdom, a place I’m always happy to revisit. A harrowing tale of a poor, physically imperfect but clever and well-trained joins a troupe that guards an important bridge. When a necromancer launches an attack, the young man finds himself the only thing standing between the undead and the village beyond. Another story was first featured in Holly Black’s compilation, Zombies vs. Unicorns. Garth Nix’s story has both zombies AND unicorns, so we all win! My favorite story is a short, sweet story about a young man whose voice was damaged in a childhood accident so he doesn’t speak much. Where he really thrives is as the Quiet Knight, his live-action role playing (LARPing) character, in which he dresses as a knight and battles the forces of evil. It’s sweet. Finally, fans of Shade’s Children and A Confusion of Princes will rejoice to see their beloved characters brought back for an encore after, in the case of Shade’s Children, nearly 20 years. Although a couple of these stories are not what I’ve come to expect from Garth Nix, they’re all fairly enjoyable. And that short stories can be read in their entirety before falling asleep makes these perfect bedtime reading. With Halloween just around the corner, I have to up my game trying to find a movie that is “scary” but isn’t so scary that my seven-year-old can’t watch it. Basically, he has to be assured that everything will be okay in the end. I know, I know, the kid’s got too much empathy. Well, we watched Monster House this past weekend and managed to fit the bill nicely. Thirteen-year-old DJ lives across the street from a crabby old man, the classic “Get off my lawn!” type, the kind of guy who takes your ball if it lands in your yard and won’t give it back. Well one day while DJ and his friend Chowder are playing ball, the basketball lands in Old Man Nebbercracker’s yard but this time DJ decides to get it back. The resulting confrontation leads the old man to have a heart attack and to be taken off in an ambulance. With the old man gone, strange things begin to happen. The house eats the basketball. The house eats an obnoxious teenager after luring him in with a kite he lost there as a child. Since no reasonable adult would believe them, DJ, Chowder, and their new friend Jenny take it upon themselves to take out the house. But what they discover inside changes their whole perception of what is happening. Kind of scary, kind of funny, and full of action, this is a great movie for sensitive kids who insist they want something “scary” to watch this Halloween. The characters are fine, there’s nothing too offensive going on and it’s just scary enough to give a couple good scares without the risk of nightmares. When we talk about décor, polka dots usually sound juvenile. But in all honesty, they can be as mature and sophisticated as you need them to be. Polka dots work well on walls, as a fabric print, and even in area rugs. As a fan of dots myself, I’m fond of the following bedrooms, each of which has been graced with polka dots. This polka-dotted ceiling looks like wall covering, doesn’t it? Well, it’s not. 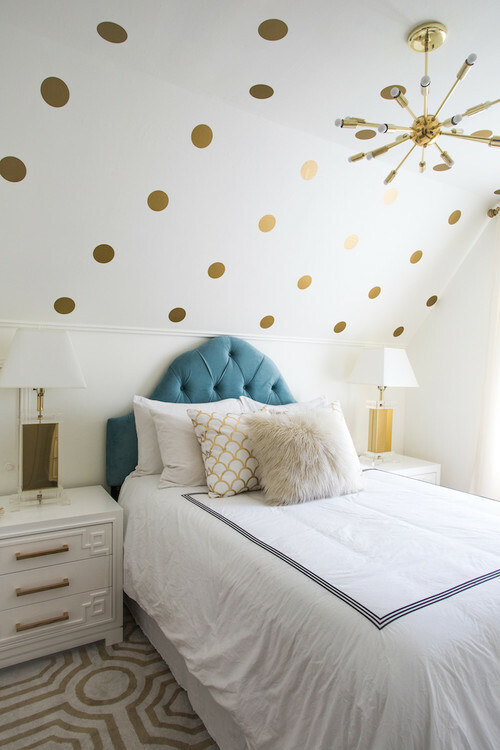 The renter of this California apartment placed gold polka dot removable decals on three sides of the ceiling. That’s a more practical option than a permanent wallpaper. This otherwise plain bedroom gets a punch of pattern with polka dots on pillows. If you’ll notice, a small piece of dotted art hangs above the nightstand as well. This colorful bedroom uses dots on Roman shades, a large bolster pillow, and the vibrant area rug. The space should be overkill but the varying sizes of polka dots –– small on the windows, medium on the pillow, and large on the floor –– work nicely. This space screams sophistication. Large black dots decorate the walls of the London bedroom, which feels like a luxury hotel suite. Modern photography and the right amount of texture complete the upscale design. 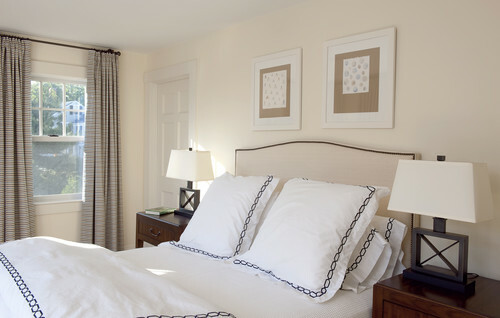 This handsome Austin bedroom comes with a small dose of polka dots on the accent throw at the foot of the bed. 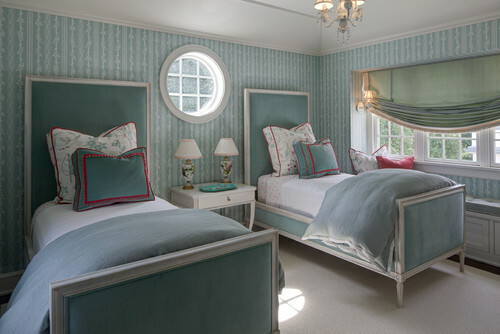 The color palette, use of pattern, and furniture selections give the bedroom a retro look. 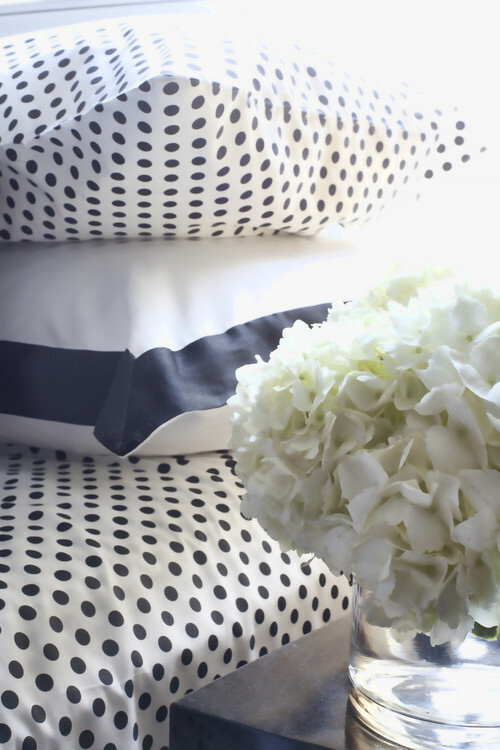 Would you consider using polka dots in your bedroom?